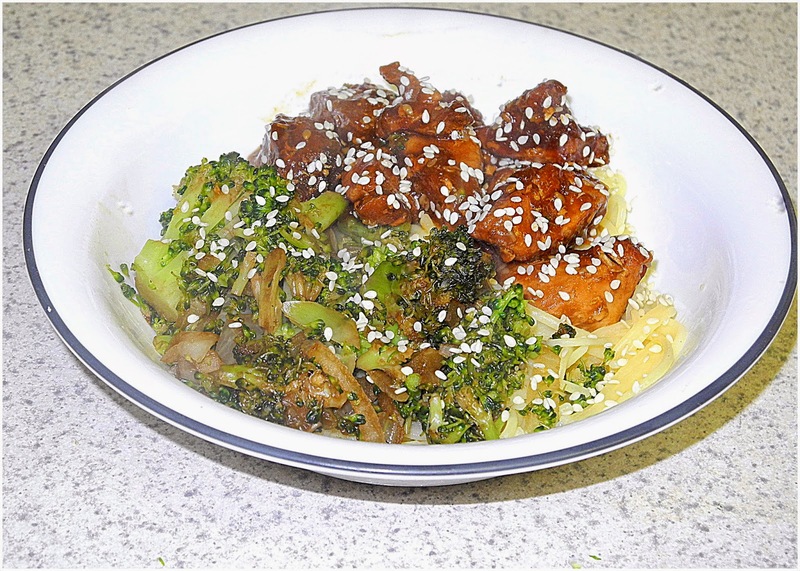 This week, Margaret chose Hokkien Noodles with Sesame Chicken from New Food Fast by Donna Hay for out WwDH. Of course, I had no clue as to what Hokkien noodles were so I went to one of my favorite sites,Wise Geek, to find out. "Hokkien noodles are round egg noodles that are usually of medium thickness. Often packaged and sold in refrigerated packages in ethnic food shops and health food stores, these noodles are favorite options for inclusion in stir fried dishes as well as in several varieties of soups and entrees seasoned with mixtures of meats, fish, and vegetables. Dishes that make use of Hokkien noodles are found all over the world, with some of the most popular recipes originating in Malaysia, Singapore, and China." I have to admit that I used Sesame Chicken which I made for Friday night since the recipe was similar and I had it left over and it made no sense to duplicate my efforts. Tonight, I altered the seasonings lightly, added broccoli and noodles and had my dinner. If I had bok choy, I would have preferred that. I topped this off with sesame seeds. We enjoyed this and I would certainly make it again. This looks great Chaya! I really enjoyed this one. I love the flavour of this sesame chicken. It looks very appetizing! This is definitely going into the rotation. I loved the flavors in this. Glad you liked it.